March 6, 2013, The Zonta Club of Guelph hosted an International Women’s Week breakfast, where a crowd of close to 100 heard our expert panel discuss the need for greater diversity on Boards of Directors. Women have much to give, they can be keen leaders, more strategic risk-takers and add great value to both corporate and nonprofit Boards. We also honoured our Young Women in Public Affairs Award Winner, Dana Gordon. 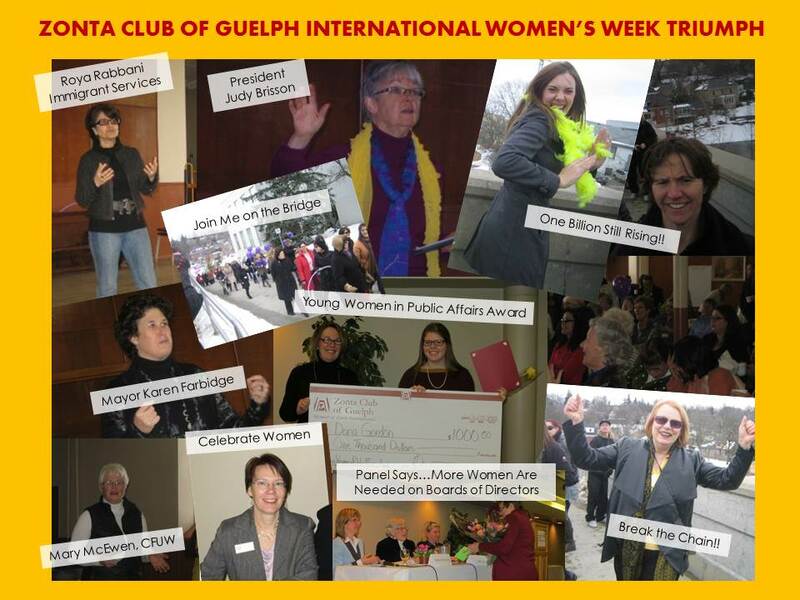 On March 8th, International Women’s Day, the Zonta Club of Guelph co-hosted a Join Me on the Bridge event, with the Canadian Federation of University Women. Join Me on the Bridge began in 2010, when women from the Congo and Rawanda met on a bridge joining their two countries to call for peace and the end to all forms of violence against women. Every year on Women’s Day, women and men around the world gather on bridges at noon to continue their call. The event in Guelph this year was energized by One Billion Rising. Everyone who joined us on the bridge danced their way through Break the Chain – again calling for the end to violence against women and girls.